Microsoft's new Surface Pro 3 configuration brings the power of Intel's Core i7 processor to an even lower price. Users who demand the power of a Core i7 processor can now pick up a Core i7-powered Surface Pro 3 for just $1,299 (£825, AU$1,688), a significant saving from the previous $1,549 (£984, AU$2,013) entry price for Intel's powerful chip. Keen Surface observers will notice that the lower price Core i7 version isn't a direct price drop. At $1,299, users will get 128GB of storage, rather than the 256GB capacity of the $1,549 model. At the new lower price, the Intel Core i7 model is priced the same as the Core i5 model of the tablet. The lower entry price for the high-end Surface Pro 3 will likely appeal to users who want to trade-off of storage capacity for price, but who ultimately still need the computing and graphics power of Intel's Core i7. Both editions ship with 8GB RAM, but the main difference is that the Core i5 processor is clocked slightly faster at 1.9GHz, and it has a slower 2.9GHz Turbo Boost performance for heavy loads. The Core i7 has a slower 1.7GHz base clock speed, but it can go up to 3.3GHz with Turbo Boost. Additionally, the Core i7 model has slightly better graphics performance. Whereas the Intel Core i5 model comes with Intel HD 4400 graphics, the Core i7 model ships with integrated Intel HD 5000 graphics. The Core i7 model also has more CPU cache at 4MB instead of 3MB on the i5 model. If you don't need the power of the Surface Pro 3, a more compact Surface 3 ($499, £317, AU$648) comes with a 10.8-inch screen and an Intel Atom processor. Even though users cannot upgrade the solid state drive (SSD) inside the Surface Pro 3 after making a purchase, there are a number of ways to augment the storage capacity of your tablet. One way is to rely on the cloud for storage, such as Microsoft's OneDrive service. Users can also add a 200GB microSD card to the device, use the single USB port to connect a flash drive or portable hard drive to the Surface Pro 3 or connect a wireless hard drive to the tablet over Wi-Fi. 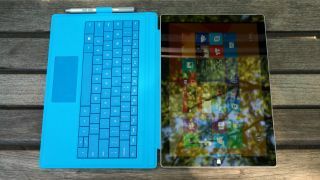 Convertible hybrids like the Surface Pro 3 offer users allow users to have the convenience of a laptop and a tablet in one device. The benefit is that users no longer have to purchase and carry two separate devices. With the optional Type Cover keyboard, Surface Pro 3 owners can convert their tablets into a notebook. With the upgrade to Windows 10 on July 29, the Continuum feature of the operating system will automatically optimize the experience for tablet or notebook usage depending on the mode that you're on. Other features that will be available with Windows 10 include a new Microsoft Edge browser, Cortana and the return of the Start menu. Windows 10 will be available to Surface Pro 3 owners for free if you upgrade within the first year of the release of the operating system.